Business Travel News has had the privilege of visiting from time to time Heathrow’s new Terminal 2, The Queen’s Terminal, as it developed from a huge hole in the ground until what you see today, undoubtedly the world’s finest airport structure. We have now used it in earnest, courtesy of Aer Lingus to Dublin and back, and are very impressed. When the awards season begins in the autumn this one terminal (it must be considered as a single airport) is going to take all the prizes. Heathrow T2 is good, very good. There is hardly any walking (at least for Aer Lingus passengers) and not a lot of people. Sadly it will get busy as airlines rush over from T1, and passengers will be converted from carriers who use the other terminals. Aer Lingus is the largest operator in T2 in terms of movements with up to 25 departures a day. Its Gold Circle lounge is to the right after passing through security (and has attracted our only criticism – EI please add the traditional green logo somewhere to the door, you can’t see the gold symbol as you turn). Entitled customers only. Virgin Little Red (which is VS and DL), a sort of franchise with EI aircraft and pilots, with VS cabin staff and technical operations, comes across next week (10 September). Eligible Virgin passengers from T3 can use the facility too. However Aer Lingus is not part of Star Alliance, whose collected members are the largest tennants of the terminal. From the spacious lounge you can see the airline’s apron parking from the window. EI has six stands. There is a full bar and limited cold snack offerings (and hot soup), courtesy wi-fi, showers too. A small point, but the loos have soft-close lids. They cost very little extra to install and are silent in operation. Somehow they add to the class of the operation. From the lounge it is down the escalators and straight to the gate, literally sitting under the lounge. Allow two minutes. If you are a shopaholic, or want a proper meal before your flight, organise your arrival, say, two hours before the departure time. 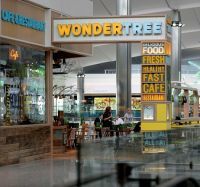 Heathrow Airport Holdings (HAH – readers will have to get used to this acronym) have fitted in 30 shops, 15 food outlets and a Plaza Premium Lounge besides those offered by the airlines. HAH staff in mauve uniforms (travellers will have to get used to that colour too) are around from the time you enter the building until reaching the boarding point to help. It is a another left over bonus from London 2012. Aer Lingus is in the main terminal (A) but most of the long haul operators will be found in the satellite (B) connected by a short moving walkway. No trains to catch or a mammoth hike! By road, entering the free drop-off point and short term car park could not be easier. Keep to the right as you come out of the tunnel and stick to that side of the road. You cannot go wrong. Once in the building drive down to Level 1 if you are picking someone up or on a short trip. Long term parking can prove very expensive. It is level 5 for departures. If you have travelled before by Heathrow Express, Underground or public bus, the hike to the old T1 is a thing of the past. Travellers to Ireland will be relieved that the long walk airside back across the road to the EI gates is no longer. It must have set a world record for airport trudging. That building will shortly be demolished allowing for the first time the A380 to use the inner northern taxiway. Heathrow suffers from aircraft congestion. Any saving to the departure point, or on landing, is welcome. The return journey was just as easy, if not easier. Just like outbound the airbridge is connected to the actual building by an escalator, but for whatever reason it is sealed rather than the see-through variety seemingly popular with new airports. Perhaps it is a security issue? No immigration is visible with this being an Irish flight and into the massive luggage hall, 10 carousals and not a person in sight unless you count a young soul on a skate board! Very strange. Your Editor was first through with no luggage. Straight out and into the landside area. M & S Simply Food can provide the home necessities if required and there is a Café Nero too. United Airlines, Air Canada and South African Airlines entitled passengers have the use of an arrivals lounge, also with showers. All are members of Star Alliance. It is a good meeting point. Only the left hand bank of lifts offers all the parking levels. But BTN had parked on this floor. It could not have been quicker.